• 1 each 5 ½” natural bristle tube brush. 1/2” diameter with 3” long bristle area. 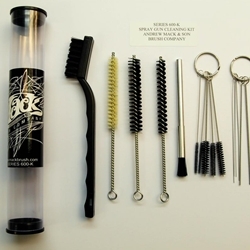 • 1 each 5 ½” nylon bristle tube brush. 5/8” diameter with 3” long bristle area. • 1 each 5 ½” nylon bristle tube brush. 3/8” diameter with 3” long bristle area. • 1 each 4 ½” spray gun cleaning brush. ¼” diameter with ¾” long working poly bristle. • 5 piece spray gun cleaning set on ring. • 6 piece spray gun cleaning set on ring without bristle.